The hour has come! And I thought it worth mentioning, as I set off on my travels from London Town, that the bell inside London's iconic clock tower - Big Ben - is celebrating its 150th anniversary today. I spent almost four years working in Westminster, so I'm very familiar with the sight and sound of the clock tower but (maybe it's just me ) I was surprised to learn that this piece of gothic extravagance is actually Victorian. A fire destroyed most of the Palace of Westiminster in 1834 and shortly afterwards Victorian architect Charles Barry was awarded the contract to create a new palace. His redesign incorporated sections of the palace that had survived the fire, such as Westminster Hall which dates back to the eleventh century. It also included the magnificent gothic clock tower. The original bell was cast in Stockton on Tees, but on testing, it cracked and the damage was irrepairable. Whitechapel Bell Foundry recast the old bell, and a sales ledger from 1858 records that the invoice was charged at £572 (this amount took into account credit given for the metal which came from the old bell). 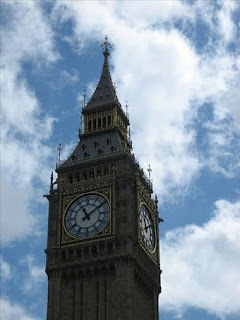 On 31 May 1859, the 13 1/2 ton bell chimed for the first time inside Parliament's world famous clock tower. Established over four hundred years ago in 1570, Whitechapel Bell Foundry, is now one of only two bell makers left in Britain. According to the Guinness Book of Records, the foundry is listed as the UK's oldest manufacturing company. Its fascinating history spans the reign of Queen Elizabeth I and the murderous reign of Jack the Ripper in Whitechapel in the late 1800's. During years of conflict, the foundry was set to work making cannon and, in the second world war, aluminium parts for submarines. This hidden treasure, still nestled in London's East End, continues to cast its world famous bells Monday to Friday. You can visit the museum and shop but the foundry's popular guided tours (which can only take place on Saturdays for health and safety reasons) are booked up until next year! UK residents can tour the Houses of Parliament throughout the year, free of charge, although they must be arranged through their local MP. Overseas visitors may only take a tour during the Summer Opening. The clock tower is not open to the general public although, UK residents with a 'special interest' can arrange a visit to the top of the tower through their local MP.